Can you outrun or out block your opponent? This challenging two person game will get you thinking as you use your bridge blockers to corner and give your opponent nowhere to go. A unique 3D suspended game board sets this game apart from your traditional cardboard game boards. Learning how to play Nowhere To Go will take a few minutes and is fairly straight forward - easy enough children as young as eight can play. Go head to head with this fun strategy based board game. Let us know what you think of Nowhere To Go if you've played it before in the comments below. Give this game a try today. If you can trap your opponent so they have nowhere to go by blocking them then you'll be the winner. Inside the box you'll see a game board, 40 bridge blockers, 2 spy pieces and the official Nowhere To Go game rules and instructions. 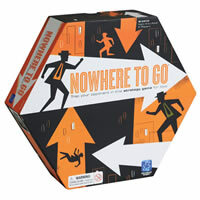 Please keep in mind that the official Nowhere To Go board game rules and instructions could be different depending on the game version you have. The rules below are some of the exact directions on how to play Nowhere To Go. Share with us your comments, funny stories, tips, advice, strategies, creative ways to play, questions about how to play, problems with the rules or anything you want about Nowhere To Go. All submissions will be reviewed within 24 hours. Click here to add your Nowhere To Go comments.